Washington (CNN) - One day after the Senate passed a full-spectrum immigration bill with overwhelming support, the chairman of the Republican National Committee re-emphasized the need for reform but said the final contours of the legislation are far from settled. "We need comprehensive immigration reform," RNC Chairman Reince Priebus told CNN in an interview in his Capitol Hill office. "I don't think we can continue to drift along with this mess of immigration laws that we have. And a mess that in many regards has been the results of our government not even enforcing the laws that are in place. There is plenty of blame to go around for why we are in this position, but I think it's about time that we address it." The immigration overhaul would create a path to citizenship for millions of undocumented immigrants, raise the cap on visas for high-skilled workers, and boost security along the U.S.-Mexico border, was approved Thursday by a 68-32 vote, with 14 Republicans supporting the measure. The Senate bill, though, is not expected to pass muster in the Republican-controlled House, where a conservative-dominated caucus stands waiting in staunch opposition to the measure. Despite that reluctance – and outspoken criticism from some leading conservative figures and Senate Republicans who opposed the bill - Priebus said "it's clear that there is pretty broad consensus in the party, in the Republican Party, that we need comprehensive immigration reform." 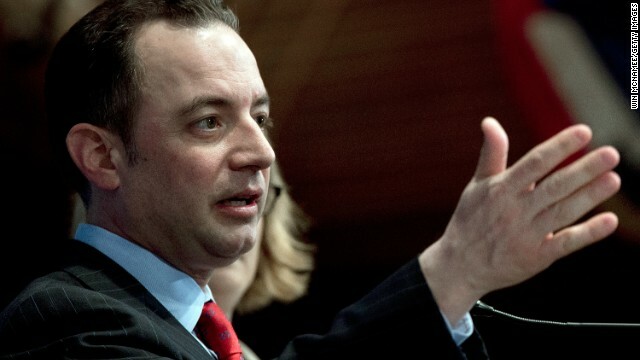 Priebus, challenged with making his party appealing to a Hispanic electorate that favored President Obama by a stunning 3-1 ratio in the 2012 election, credited Republicans for helping push the immigration bill over the Senate finish line. He pointed specifically to Florida Sen. Marco Rubio's decision to work inside the bipartisan "Gang of Eight" that crafted the legislation before taking it to the full Senate. "I'm game. Tell me about all of these new "voter suppression laws" that are being enacted. I'm so excited to hear these new laws and how they suppress votes." Go do the research yourself. It's not our job to inform you of the myriad laws enacted by GOP-controlled state legislatures and the overwhelming pile of studies and historical record that prove the measures they are attempting and talking about trying are designed to and will restrict minority, youth, elderly, disabled, etc., voter registration (ID laws), voter turnout (shortened polling station times, reduced early voting, closing polls on Sundays), dilute their voting power (electoral college changes), corral and concentrate minority votes into fewer districts despite larger populations (gerrymandered re-districting plans), etc. All of that took place in 2011 and 2012 in an attempt to gain back the WH...and the only reason the GOP maintained the House is because the gerrymandered so successfully that they won a majority of seats despite receiving 1.3M less votes. You may think you're cute "playing dumb," but you just look ignorant and uninformed. Ok , then do something , the GOP is so dumb it's stupid . The Speaker of the House needs to stop passing the bottle around, and start passing some bills ! As if my assertion that right-wingers are insanely ignorant needs any bolstering, witness the comments from some of the regular right-wing village idiots that call immigration reform "amnesty". Saint Reagan, the right-hand man of Jesus himself, granted amnesty to illegal aliens with the sweep of his pen, with little or no preconditions. To right-wingers, the new definition of amnesty means meeting 5 different criteria, including paying fines, back-taxes, and learning English, and waiting at least 13 years to obtain citizenship. How do right-wingers reconcile the stark contrast between what your beloved B-list actor / President did, and today's proposed path to citizenship? That will be the end of the GOP. You suicidal? – You're right about gerrymandering districts. It happens all the time. Ever hear of a state called California? They do it there to the dems favor. Why do you choose to be so blinded by your side and not recognize that they are bad, too? – VRA "to change voting rights". What a joke. What "rights" are you talking about? Asking for an ID is very reasonable and the only reason you don't want it is because it's mostly dems that will have to go get an ID. Yes, there are some that this could be a task – so let's figure out how to get them ID's. Jeez. But for the most part, it's not a difficult task, unless you're you, a person who is the prime example of the soft form of bigotry from low expectations. I ask you this, who do you know that can't obtain an ID??? It benefits the individual to have one, right? So sad. who are the republicans everything they said no .they hate immigrants .i bet they will loose the election if they block these bill.my great grand parents build these country when they were brought here as slave to build america.who own america nobody is build by immigrants. "But I can't get my arms around why they are so adamant about passing this now for any reason other than political. And you guys on the left constantly frame it that way, too. It's all political. That all you care about. Politics. Shameful." Probably for the same reason that George W. Bush tried to do it before the 2006 elections. Votes. The Bush administration saw the handwriting on the wall, and how they would lose in 2006. Unfortunately, their Republican colleagues in the Congress just didn't see it that way. And now, Republican history is repeating itself. Losing votes because they'd rather complain about immigration reform than actually do something about it. ... ... With the incentive in Obama care for business to hire these new "residents," paychecks will decrease and unemployment will increase. That's no typo, is it? 'If businesses hire new workers, then unemployment will increase.' It's that Limbaugh Logic again. No typo, incomplete thought, "unemployment for American citizens will increase." Democrats only want amnesty for the world. They don't give a chit about this country. Looks like you got a stalker, Sniffit. Must be that soft bigotry of low expectations. Or something. So, did he offer a plan of his own from what the party will accept? It doesn't sound like he is. Until he does, I don't really care what he say. Either join a group with their platform, offer your own ideas, or just be quiet and listen to what everone else is saying. Yeah, we wouldn't be in these mess if weren't for the failure of Ronald Reagan to enforce the amnesty in 1986. This is a problem that Republicans created and were glad to ignore when it was in their interest to do so. They liked the cheap labor the system provided. Now that the political landscape is changing and they need these votes it time to fix the mess which they created. Laughable! You guys are so cute. The sniffmeister was the one that had to answer for the Dutchman, as he clearly can't speak for himself. From Data, to Lynda, to Domincan, to Sniffit, to Dutch, to Rudy...you guys are all like bullies on a playground and gang up, throw out ad hominem attacks and never ever would dane to actually listen to another's point of view. Sniffit is right about the ALEC-written bills that flooded GOP controlled legislatures in recent years. There were 40 ALEC bills filed in Missouri this pas legislative session. You all do some research on the American Legislative Exchange Council. I for one do not want corporations, some of the foreign corporations, even Chinese government-controlled corporations, writing laws and getting them passed by the GOP in the name of profit and low taxes and all the other drivel that dribbles out of their slobbering mouths as they reach for the money and gifts lobbyists pass to them. ALEC is a threat to American representative government. Not the only threat, but it is a threat. Sorry, it should be past legislative session. The man is a tool. We need Comprehensive Immigration Reform is code for lets give Amnesty to all the illegal aliens so that we can get some votes. This is a terrible way to run the party and shows how bad things have gotten in the GOP. We need men and women who will enforce the law. We need people who will stand up to President Obama when he tries to pick and choose which laws he want to enforce. We need a clear vision of what Immigration Reform should look like. It should start with taking all incentives away from illegal immigration. If the illegal aliens living here lose their jobs and can't find another one then they will leave. We need to make impossible for illegal aliens to get or keep a job. We need to be proactive about creating more good paying jobs in the United States and not worry so much about bringing people from other countries into the US. Its time to take care of our own.